Unsold Cars Around the World – Why Visuals Help! 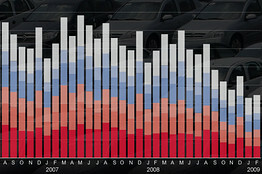 If you were ever wondering what it really means to have car sales numbers off each month by 40%+ for the last 6 months, visit this unique pictorial. These visuals strike a unique chord that numbers in the WSJ simply cannot. Compare the CHART to the massive full car lot.